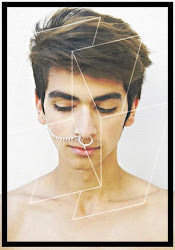 Okay I know it seems like I've died or abandoned this blog and I'm here to dispel both of those. In between working almost every day during this summer and trying to pack for my big move back to Austin I have little time for anything else. BUT I'm here to publish this DIY. Ombré seems like it's everywhere lately. In hair, in fashion, even on WALLS. 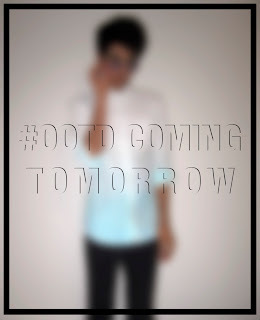 So I wanted to try to make an ombré shirt myself and I did! I bought a shirt from a thrift store in Houston for like $2 because I figured if I messed it up it wouldn't be that big of a deal. When buying a shirt to dye you want to use something made out of a natural fiber (cotton, linen, rayon, etc.) If you try to dye something like polyester or nylon you are literally wasting your time because it won't dye. The dye I used was from Hobby Lobby in Tropical Green by Dylon. Now I do have one thing to say about the dye. This was my first time dyeing anything and I don't know what happened but as you can see it come out as turquoise, not tropical green. I still love it though. So I followed the instructions about mixing the dye and I used our big sink in the laundry room. Make sure to use a stainless steel or glass sink to avoid tinting the metal or marble (this is very important). Also, if you decide to use a new article of clothing to dye, wash it before to prep it. Once the dye was mixed I put the shirt on a hanger and because I couldn't think of anything better I held it up the entire hour and a half it took. This is the hardest part. In order to get an even ombré and not a striped gradient (*moment of silence for striped ombrés*) set a timer in even increments. I did four 20-minute increments and then one 10-minute increment. 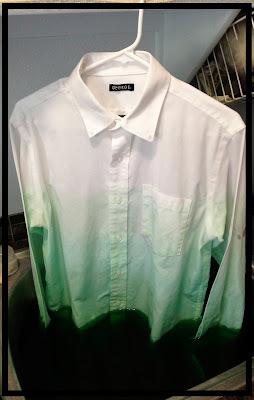 Starting, you dip the bottom of the shirt (or whatever you're dyeing) into the dye and let it sit for 20 minutes. 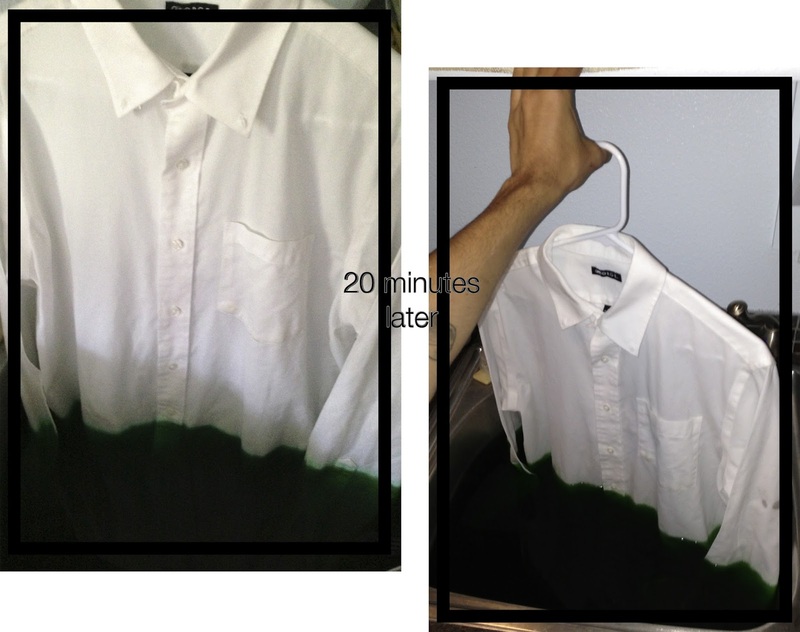 After the 20 minutes is up, dip a little more of the shirt into the dye, I moved the shirt in 2-3 inch increments. Don't do much more than that or you'll get stripes. Continue this process until the time is up. It took me an hour and a half. After you're done ombréing just drain the sink of the dye and rinse the article with cold water making sure to rinse the dye from the lightest part to the darkest part. You're done! Throw the shirt in the wash by itself (ON COLD) and wear it out after it dries! very cool diy, great way to change up any time in the closet. thanks for sharing.